Our Managing Director, Stewart Ower, was presented with an Honorary Life Membership to the UKSpill Association yesterday evening at their Annual General Meeting and Awards Dinner at the Waterman’s Guild Hall, London. Stewart, who has spent over 25 years within the Environment Protection industry, has watched and supported the Association grow from its inception in 2004 and more recently served as its Chairman between 2015 and 2017. During his term as Chairman, Stewart helped to raise the profile of UKSpill and improve the standards of spill response within the sector. Spill Training Course At Fire Service College A Huge Success – Book Your Space Now! Last month, Compass Environmental delivered their UKSpill Approved Advanced Environment Protection Techniques spill training course to specialist Fire Officers from across the UK at the Fire Service College, Moreton-in-Marsh. The day comprised of a morning session, studying the response to real life spillage incidents, followed by an afternoon practical session on the Fire Ground tackling a complex spill scenario. We are pleased to say that all 26 delegates successfully passed the course. In partnership with the college, we are now opening up this course to wider industry. So, whether you are a professional spill response company, a business that has the potential to cause environmental pollution through spillages or an in-house trainer seeking expertise in this area, this course is for you! Our next course at the Fire College will take place in March 2019. The cost of this will be £350 + VAT per person with a maximum of 8 delegates per course to ensure every attendee gets good hands on experience. There is accommodation available on site for an additional cost of £80 per night for dinner, bed and breakfast. For more information and to book your place on our March 2019 course, click here. In conjunction with Evergreen Insurance Services and Aviva, one of the UK’s largest insurers, we are delighted to announce the launch of Oilshield – a new insurance and risk management product for fuel oil distributors. With limited choice in the market and distributors facing ever increasing commercial risks, we identified a real need for a fresh and innovative solution specifically targeted at the fuel oil distribution sector. That solution is Oilshield – a comprehensive insurance and risk management package that provides protection for your whole business, all under one policy. Oilshield embeds risk management at the heart of every policy. Compass Environmental will be working with each client to identify and manage risk through the development and delivery of a bespoke risk management programme. In addition, Compass will be providing a 24/7 Spillage Claims Management Service. Our extensive experience in managing thousands of incidents will ensure the reputation of our clients and the environment are protected through the proactive management of spillage claims. Our Advanced Environment Protection Techniques Spill Training course has been embedded into the HazMat Advisor Course at the Fire Service College, Moreton-in-Marsh. The HazMat Advisor Courses train specialist officers within the Fire Service to deal with incidents where hazardous materials are involved. Often these incidents pose serious risk to the environment and so the College has recognised the need to include an Environment Protection Module in its training of these officers. 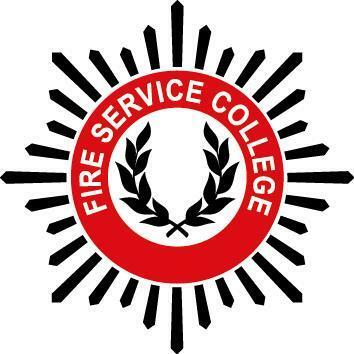 Our Managing Director, Stewart Ower, has been welcomed as an Associate Tutor at the College and will deliver the one day Environment Protection Module which incorporates both classroom and practical exercises on the fire ground, a world class training facility which permits the creation of very realistic incident scenarios. In addition, Compass and the Fire Service College will be marketing our Advanced Environment Protection Techniques Spill Training course commercially so that delegates from wider industry can benefit from this unique training opportunity. 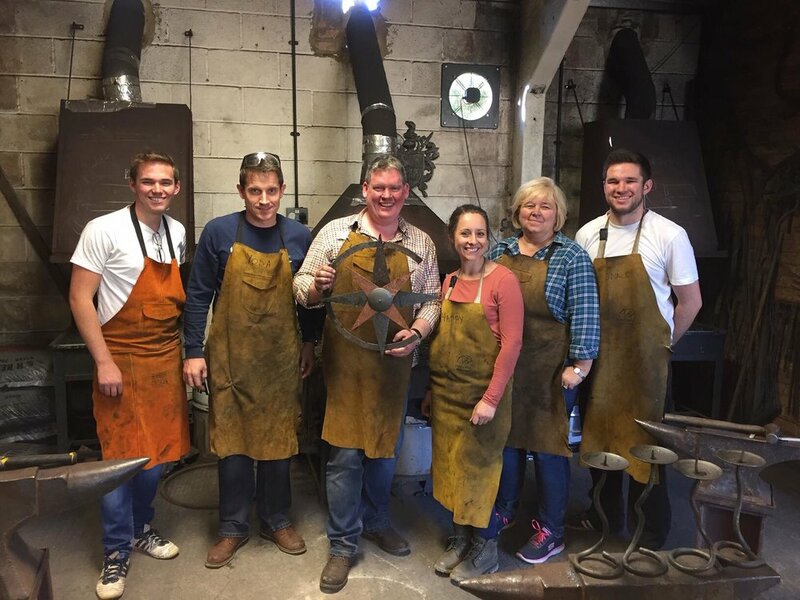 The team at Compass got hands on and covered in soot with a Blacksmithing experience yesterday at Anvil Forge! 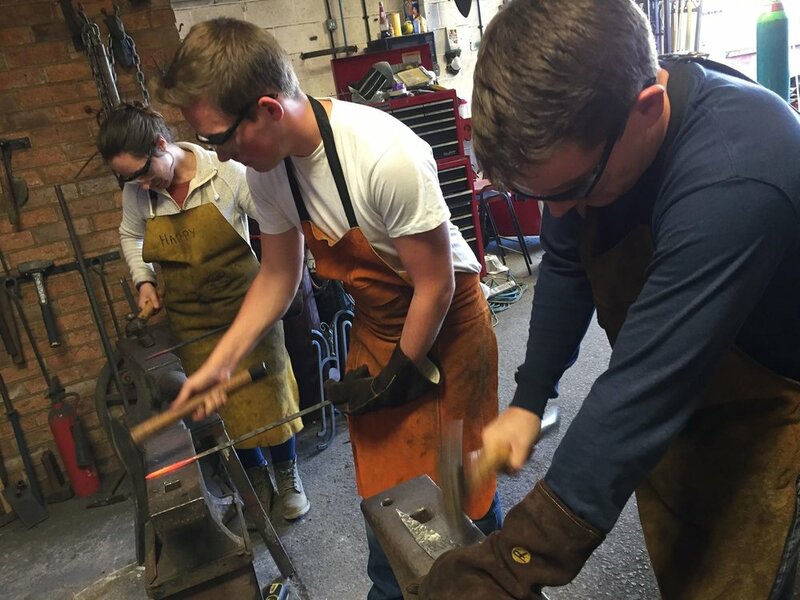 Our day kicked off with the task of creating our own pokers, giving us a chance to practice the fundamentals of Blacksmithing and to play with fire! Once our technique had been perfected, we then had the opportunity to hone our craftsmanship with our own personal projects. 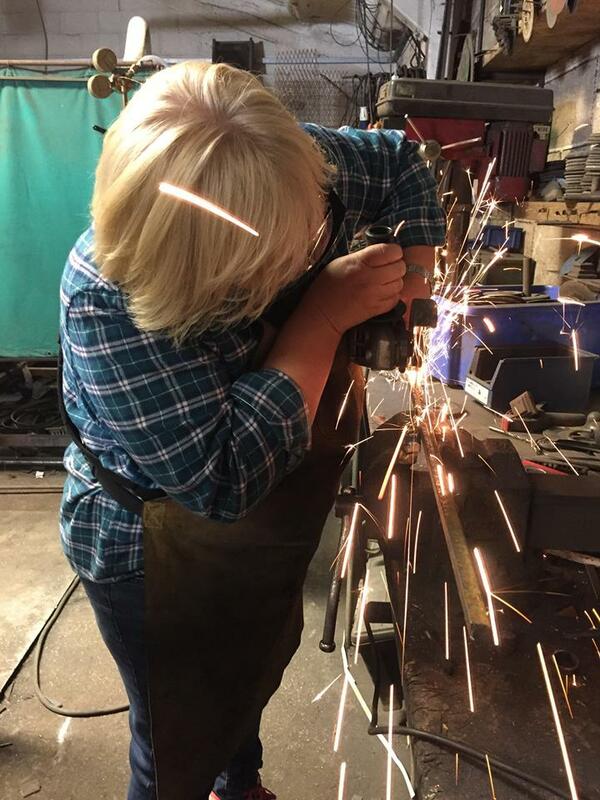 Instead of using this as a chance to make augers (a complete oversight on our part), the team used their new skills to create candle holders, hooks, garden accessories and Christmas decorations! The last part of the day was spent building a team piece that will take pride of place in our headquarters. Whether it was bending metal with brute strength; wielding an angle grinder to put on the ‘delicate touches’ or smashing a hammer to create a subtle pattern, everyone played their part in piecing together our company logo. Another job well done by Compass Environmental! Compass move into their new Wokingham Headquarters! Read all about our Spill Training with LCM Response Staff. Compass welcomes Lucy Maddison to head up the Environment team. Read more about Compass Environmental’s visit to Interspill 2018. Six Months In - Off To A Flying Start! It's been a busy six months for Compass - we take a look back at some of the highlights and best bits!